The BBC News site has just put up one of its excellent audio slideshows, in which a short sound interview with someone is accompanied by a series of related images. 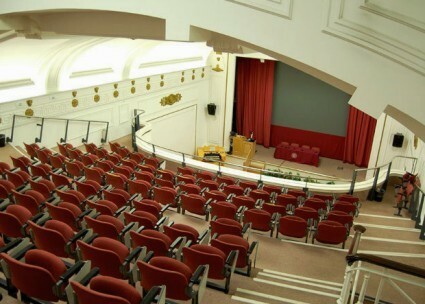 The latest slide show is The first silver screen, and comprises an interview with the Vice Chancellor of the University of Westminster, Professor Geoffrey Petts, talking about the university’s lecture theatre in its Regent Street, London campus, which in 1896 when it was known as the Marlborough Hall was the venue for the debut of the Lumière brothers’ Cinématographe. A campaign has been launched to restore the venue as a multimedia facility and teaching space for our students and the wider community. They have already received a million pound donation from the MBI Al Jaber Foundation – a Saudi billionaire, according to the BBC site. The target is £5m. Well, it is good to know that there are Saudi billionaires out there who care about the restoration of early cinema venues. The BBC piece says that the venue counts as Britain’s first cinema, because it was where the first public show of moving pictures took place in the UK. Unfortunately this is wrong on three counts. Firstly, it was not a cinema – it was a lecture hall in what was then known as the Polytechnic, home to many a magic lantern show and popular lecture on discoveries and new technologies, with the Lumière films being introduced as a new scientific attraction on 20 February 1896. Secondly, the first showing of moving picture films in Britain has taken place a year and half before then, about ten minutes’ walk away at 70 Oxford Street, when on 17 October 1894 the Edison Kinetoscope (a peepshow device showing celluloid film on loops) had its debut. But even if you are talking about projected film shows, then the Regent Street Polytechnic still isn’t first, because the photographer Birt Acres had already given a projected film show to members of the Lyonsdown Photographic Club on 10 January 1896 and to members of the Royal Photographic Society at 12 Hanover Square, London on 14 January 1896. But setting aside such nitpickery, the Polytechnic was the venue where motion picture films on a screen truly took off in the UK, and it is a marvellous, evocative venue with an important history that the present university clearly values highly. There is further information about what they are calling the Regent Street cinema project on the University of Westminster’s website, including the above promo video which knits together the cinema of the 1890s with the filmmaking of today by the university’s students. If you want to contribute to the fund, or you know any other Saudi billionaires who might be encouraged to do so, visit the site (which has the bold URL www.birthplaceofcinema.com) and read on. There’s a timeline for the Polytechnic on the University of Westminster site, which gives the basic history of the site. The Lumière brothers weren’t actually there for the debut shows – instead they were hosted by their friend, the magician Félicien Trewey – read his story on Who’s Who of Victorian Cinema. The Polytechnic, established was established in 1881 (out of the old Royal Polytechnic Institution) by Quintin Hogg – read about him on www.technicaleducationmatters.org. Information on the pre-cinema projection of lantern images at the Poly is on the Magic Lantern Society site. There’s a well-illustrated documentary from 2007 on Louis Lumière made by University of Westminster students Alexander Marinica and Mamoon Ahmed on YouTube – part one and part two – which has some very thoughtful contributions from historian Deac Rossell on the Lumières’ achievements. Details of the project before this stage can be found at the above website.